At Hillcrest everything is a building block. So while we are preparing our older children for graduation, the younger ones are moving up the ladder to Pre-School and Pre-K. We introduce circle time in our infant/toddler age group. Circle Time is one of the favorite activities for our little ones; it is never too long because the length is dictated by attentiveness and age of the children. 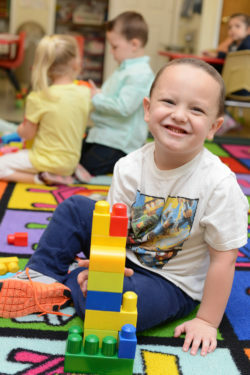 We encourage singing songs, dancing, and learning colors and shapes. 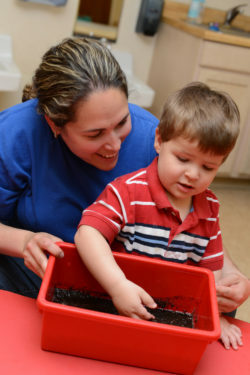 We explore sensory development with several different mediums such as, cooked spaghetti, pudding, dirt, sand, bubbles, and sometimes even snow. While every day at Hillcrest varies from education to play, the class is always filled with learning and fun activities. Children have morning play time before they get down to business. Older children start their day with Circle Time; singing songs, counting friends, days of the week, months of the year, holidays and much more. Snack is served before we split up into centers and work on our letters, shapes, and numbers as well as crafts that include cutting and pasting and developing their Imagination is encouraged with dress up play, blocks, Legos, car tracks, and dolls. Our toddler group expands on circle time making the sessions a little longer for our Toddlers than in our Infant-Toddler group. They introduce new concepts and continue encouraging the basics. At this age level the children start breaking into centers. Centers are smaller groups that move around the room to different activities. 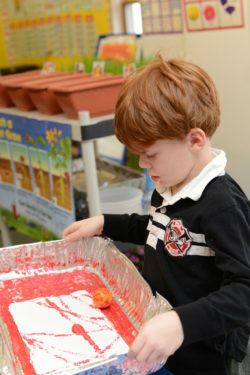 Each center is fun and structured to give the children many different activities to explore. Preschoolers are honing the skills they will need in Pre-K. More difficult concepts are introduced at this time. The children learn colors and numbers in Spanish and Sign language as well. They begin their exposure to sequencing and patterns. 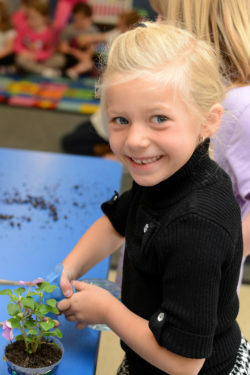 There is no shortage of science as we learn about plants, the weather, and grow our own butterflies. 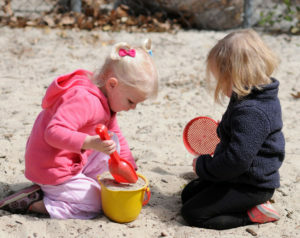 Every age group has access to our playgrounds every day (weather permitting). After outside time the children will have their lunch and rest time. When everyone has rested, had snack and refueled their batteries we spend the afternoon on activities that include parachute play, bubbles, games, dress up and so much more. The children love nature walks, doing sidewalk chalk, and having free play on the playground until pick up time.